ORE-IDA TATER TOTS on the grill? Sure, it's easy! Get out a disposable foil pie plate and let us tell you how it's done. 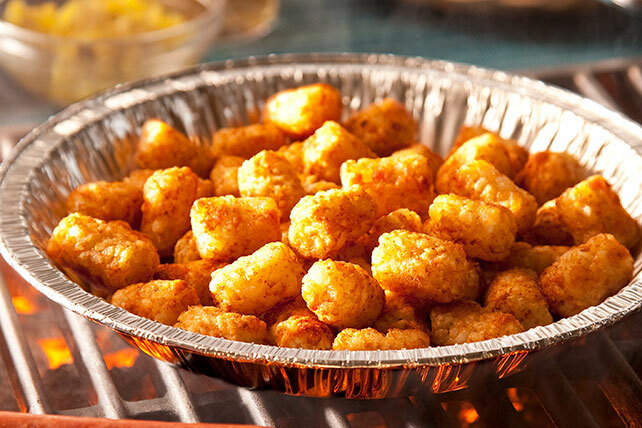 Spread TATER TOTS onto bottom of disposable foil pie plate sprayed with cooking spray. Place pie plate on grill grate. Grill 20 to 22 min. or until TATER TOTS are heated through, stirring after 12 min. Since grills heat differently, keep an eye on the food as it cooks on the grill to prevent it from burning. If necessary, adjust the grilling temperature to maintain an even temperature. Use disposable aluminum pans for your outdoor cooking needs. They make cleanup a breeze!